At 2 inches high and approximately 2.75 inches round, this Speckled Gold Mercury Glass Votive Candle Holder features an antique speckled metallic finish. The antique metallic finish is slightly reflective adding to the beautiful appearance of this votive. Each votive is embellished with unique speckled pattern giving it a glamorous old-fashioned look. The speckled appearance can be described as spotted or mosaic with a dazzling gold finish that will be sure to make a strong impression. No two votive holders will look the same in design; every single one is unique and has character. The thick bottom rim of the glass votive will not feature the speckled design, and will instead be filled with the stunning transparent gold color. The glass votive has an opening measuring approximately 2 inches, making it the perfect size for your favorite tea light candles. These elegant candle holders will pair perfectly with our battery operated LED tea lights. You may also use standard real wax tea light candles to add a gorgeous natural lightening effect. The glass used for the candle holder is great quality, it is thick and sturdy. With this beautiful glass votive candle holder you can add a vintage, antique look to any birthday, wedding, special events, and home décor. Although these are mostly used for special events these candles holders can bring out exciting new and innovative ways to decorate. The metallic and slightly reflective finish will come together to intensify the lighting experience, making this glass votive candle holder a great addition to your home or themed wedding décor. 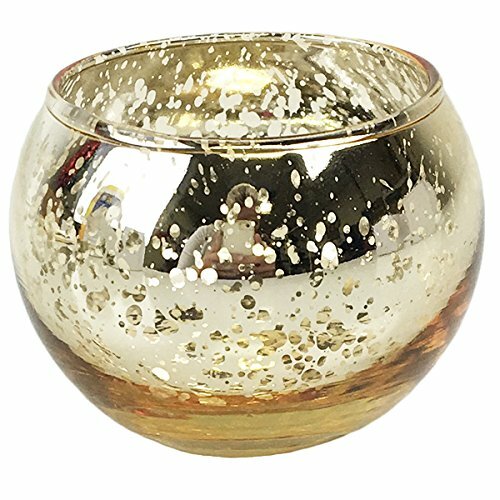 With this eye catching votive candle holder you can create a stunning ambiance or present beautiful accent décor with this Speckled Gold Mercury Glass Votive Candle Holder.